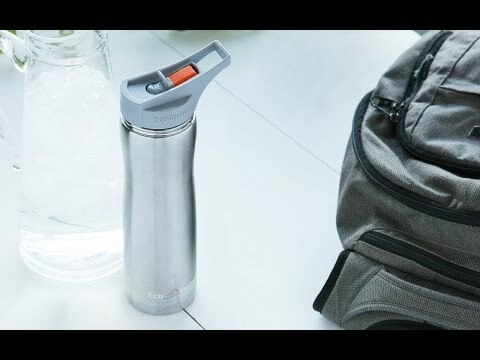 Classy, sleek, and thoughtfully designed, the Aspen Insulated Bottle is ideal for any drink, any temperature, any time. The top features internal threads so it opens easily and the rim is smooth for comfortable, hygienic drinking. The large capacity will even keep a full bottle of wine fresh and at the right temperature for hours. Dimensions: 2.9" diameter x 11.95"
Keep drinks ice cold for up to 36 hours (no, that is not a typo). You’re probably wondering how that’s possible. We certainly did. The answer is in the insulation. The Summit is triple insulated and made of premium stainless steel, free of BPA, phthalates, and liners. Perhaps just as impressive, the Summit is “sweat proof”—meaning that condensation won’t form on the bottle. Put it inside your backpack or lunch bag without fear; the other contents will stay dry. Or if you’re traveling by car, the bottle fits nicely inside most cup holders. And speaking of being on the go, you can flip up the integrated straw with one hand and take a refreshing swig. The top’s loop handle makes it possible to carry the Summit with a few fingers, if needed. Summit’s ergonomic body is pleasantly curved for a better grip. The straw removes easily to pour or sip straight from the bottle. It makes cleaning simper, too. With this bottle, there’s certainly a lot to drink to.